For the first time ever, people around the world will signal their support for gender equality while navigating our planet’s beautiful oceans. Don’t miss this inspiring initiative! 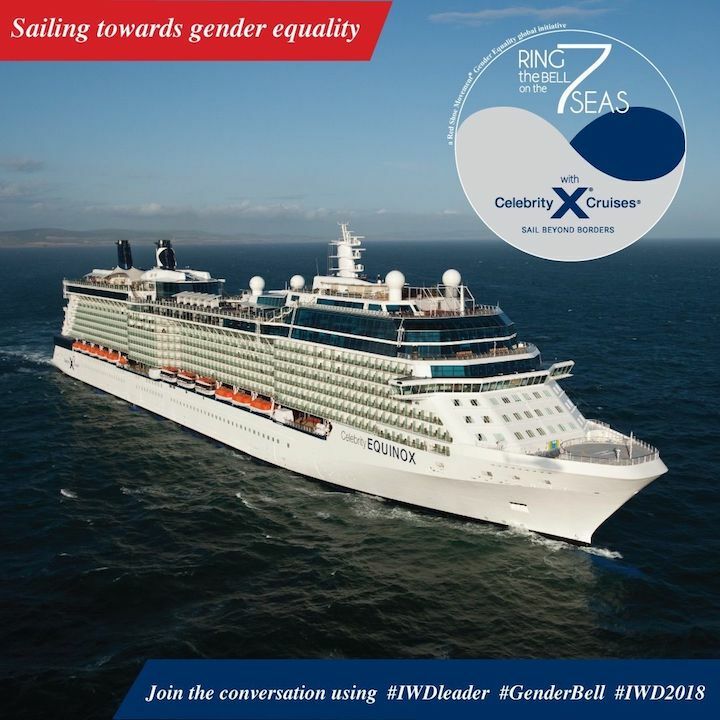 Echoing the “Ring the Bell for Gender Equality,” on March 8, 2018 we rolled out the “Ring the Bell on the 7 Seas,” a Red Shoe Movement Gender Equality global initiative with Celebrity Cruises. (Another amazing initiative, this month we rolled out our 2018 Hall of Fame and our new Red Shoe Leader Award!) We are beyond excited to have celebrated this International Women’s Day across the world’s oceans with people from the most diverse cultures! 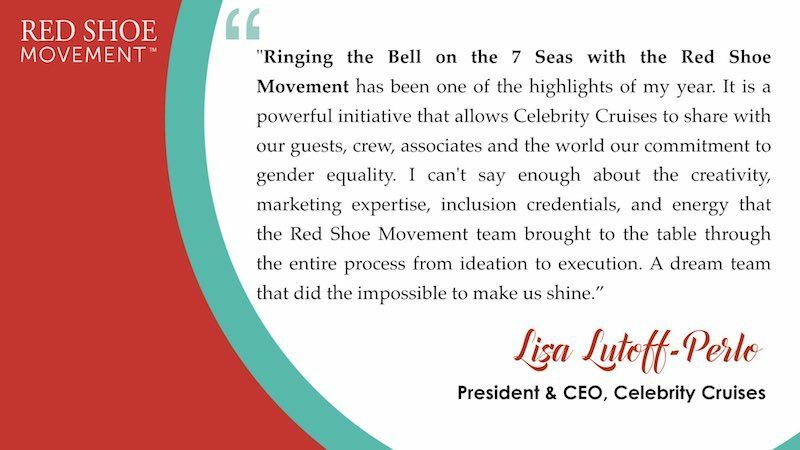 We couldn’t have dreamed of a more perfect day to launch the “Ring the Bell on the 7 Seas,” a Red Shoe Movement Gender Equality global initiative. It was 60 F with bright blue skies in Fort Lauderdale, Florida. The only uninvited guest was the wind. And yet, nothing would’ve been the same without it. 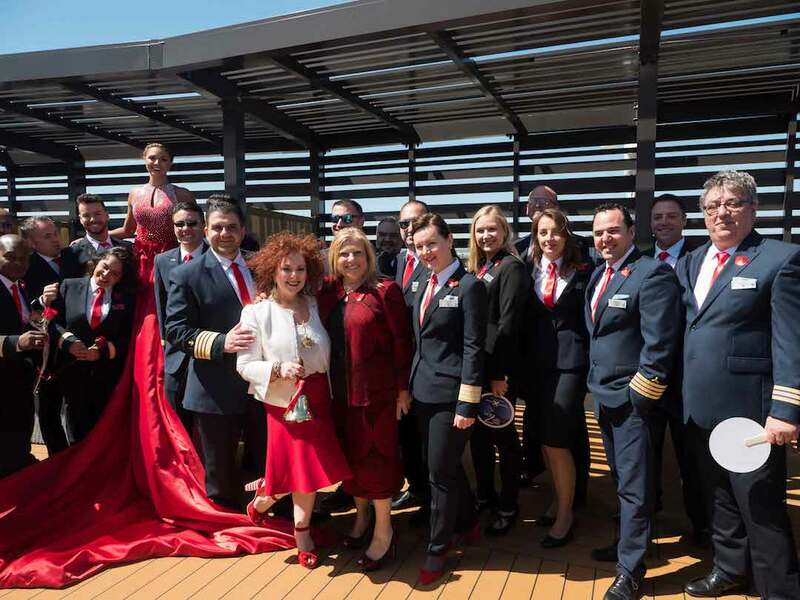 Our CEO, Mariela Dabbah, our Head of Communications, Gustavo Carvajal and our social media team and photographer boarded the Celebrity Summit to find the entire crew — from the kitchen staff to the captain of the ship— dressed with red shoes, ties, scarfs, and ribbons to honor our mission and our #RedShoeTuesday campaign. As we walked down the side of the ship to the top deck a line of wait staff welcomed us with red cocktails and roses while the DJ blasted a playlist of female singers through the speakers. 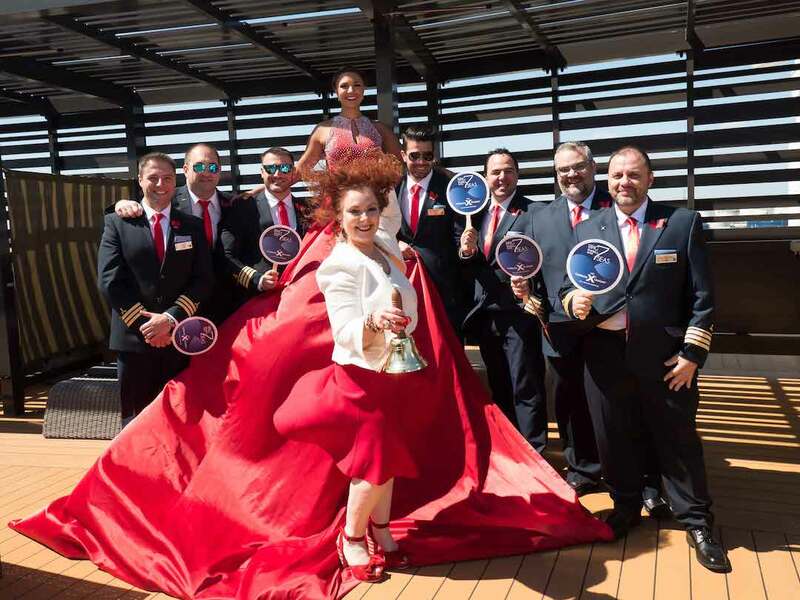 In no time the deck was filled with around 200 crewmembers, Celebrity Cruises’ executives including their CEO, Lisa Lutoff-Perlo, media and guests. We all stood behind the beautiful red podium holding The Bell. 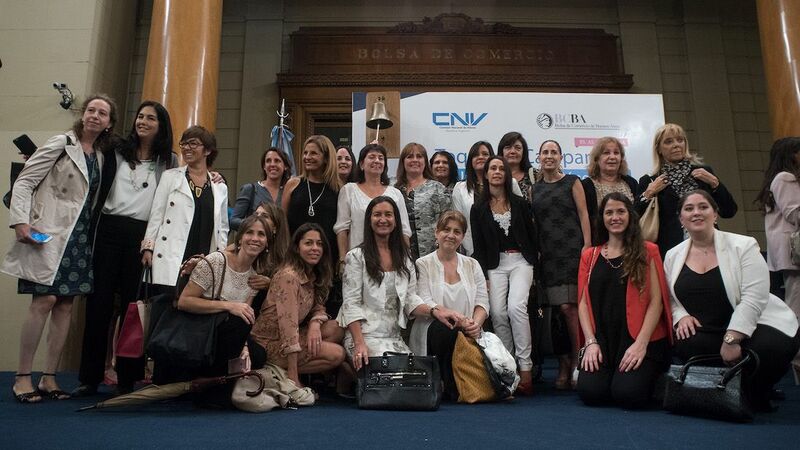 Mariela framed the occasion by sharing how the ceremony was echoing the Ring the Bell for Gender Equality being held in 63 stock exchanges around the world. She invited everyone to ring their own personal bells at home. But of course it was hard to pretend this was a normal speech. As she talked, the wind took over her hair and it pretty much looked like she’d fly away any minute. Then Lisa, underscore how fitting it was to Ring the Bell in such a windy day when we were all feeling the winds of change. She read the event’s Manifesto while Captain Theocharis Charalampos and a bridge officer had to hold down The New Leader Times so it wouldn’t be blown off to the sea. While the formalities were dispensed with, the party really started. People truly celebrated the occasion. We took pictures with a beautiful member of the entertainment team who wore a long red dress several feet long, which became the perfect live background, constantly morphing with every gust of wind. The icing on the cake of this perfect event was a luxurious lunch onboard! Throughout the day, we received pictures, videos and Boomerangs from all over the world. The most amazing images bore witness of how far the initiative had traveled and how much people had engaged with it. Adding red balloons, and dressing up with their best red outfits for evening parties! We’ll soon share the recap video here!! Can’t wait to see how we top this celebration next year. But you know we will! What is the Ring the Bell for Gender Equality? As we continue to find ways to amplify our mission and awaken the global community to reach a leap of consciousness in gender equality, we created the “Ring the Bell on the 7 Seas.” An initiative that would expand not only the message of the Ring the Bell for Gender Equality, but that also intents to echo the proverbial school bells welcoming girls everywhere. Particularly in those countries where girls education is not yet a reality. It’s our way of enabling the inspiring sound of bells to reverberate across the planet from sea to shining sea. The “Ring the Bell on the 7 Seas” is a symbol of a world joined by oceans and by travel. An experience that opens our minds. Helps us see new perspectives, different cultures, and ways in which people live and do things. Hopefully, an experience that leads us to understanding that we every human being deserve equal treatment and respect. What happens during the “Ring the Bell on the 7 Seas”? 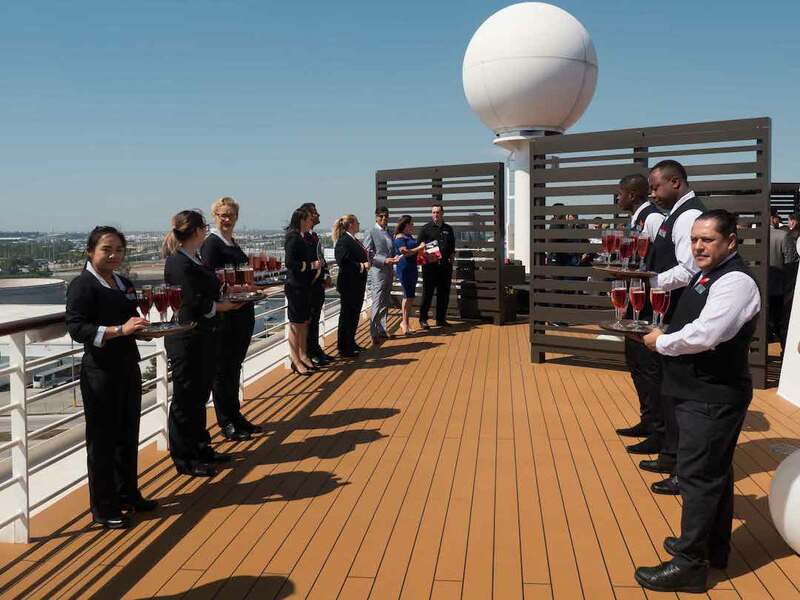 On March 8, 2018, all of Celebrity Cruises ships will host a ceremony onboard for passengers and crew. Everyone will wear red shoes, ties and accessories in support of the Red Shoe Movement’s mission —to accelerate representation of women in decision-making positions— and our ongoing #RedShoeTuesday campaign. 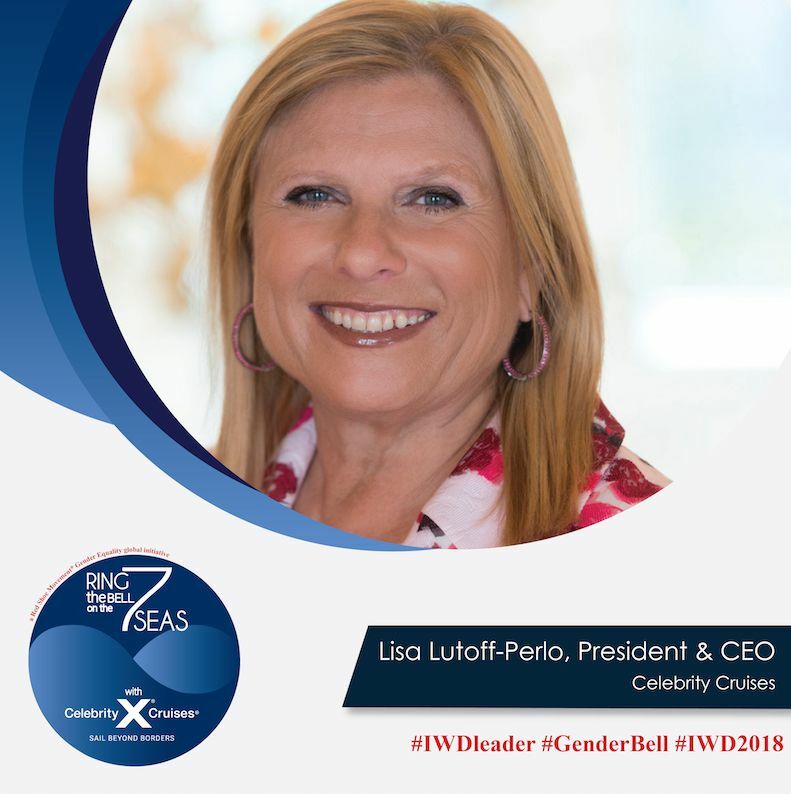 The captain will read a message from Celebrity Cruises’ CEO, Lisa Lutoff-Perlo, one of our 2017 Hall of Fame honorees and keynote guest at our 2017 Signature Event. 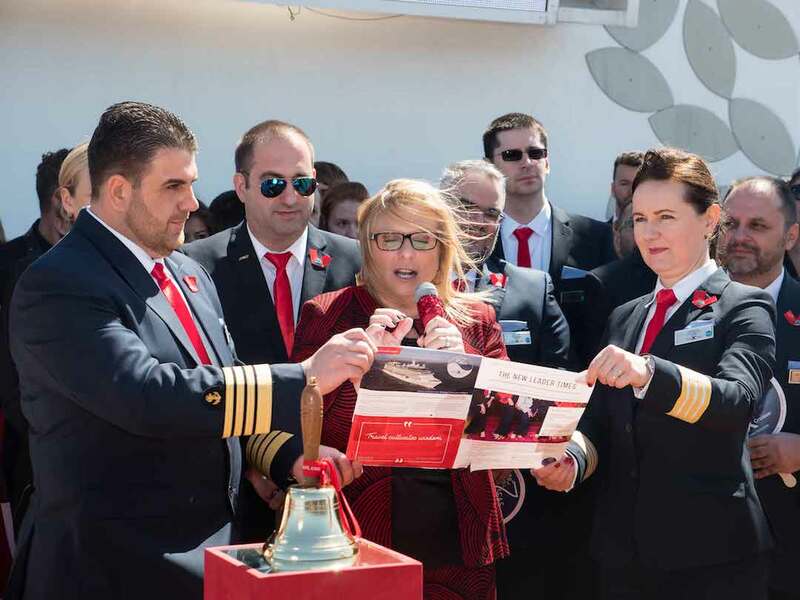 Then each captain will ring the bell to echo the bells ringing across the globe both on the water and on land to raise awareness of the importance of gender equality, of equal pay for equal work, and of shared power. And then, from the Caribbean, to the Arabian Sea, and from the Indian Ocean to the Tasman Sea, each ship will blow its horn. 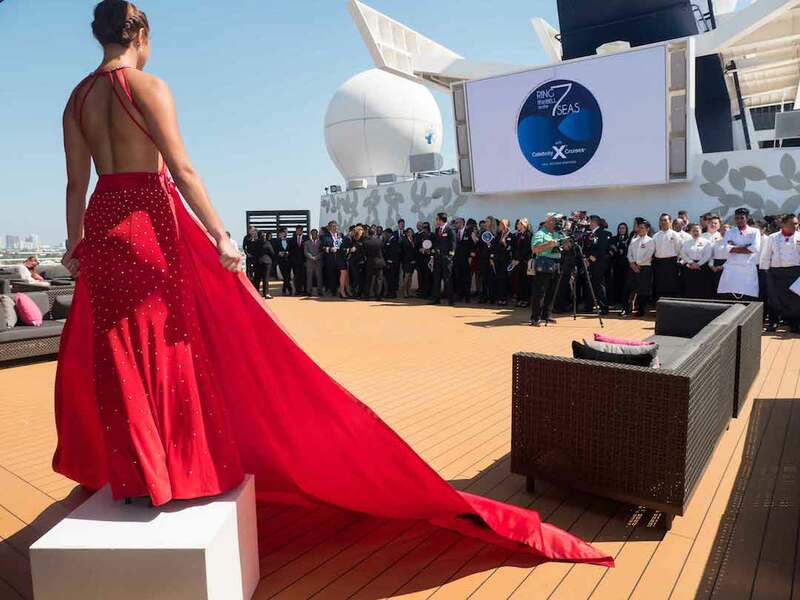 A similar ceremony will take place at Celebrity Cruises offices around the world. Let this be a unifying moment when we all raise our glasses to toast to a new era of gender equality. An era of fresh, new leadership with innovative ideas that bring answers to 21st Century challenges. A leadership that is inclusive of everyone. 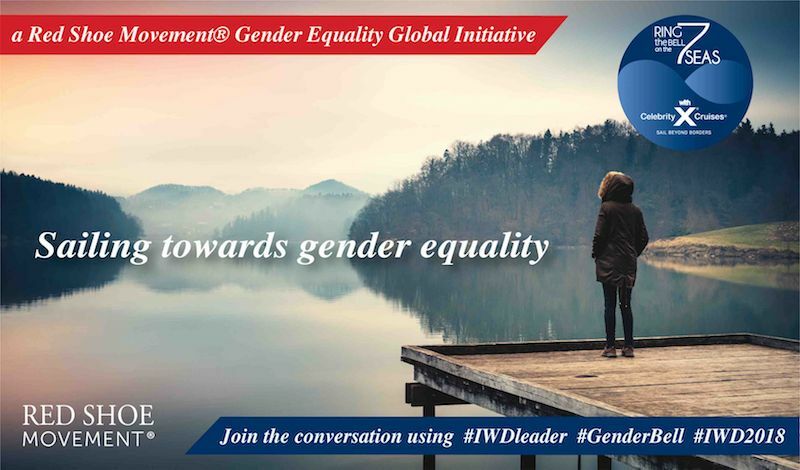 Join us on social media #GenderBell #IWDleader #IWD2018. The wind is at our back. Let the journey begin!